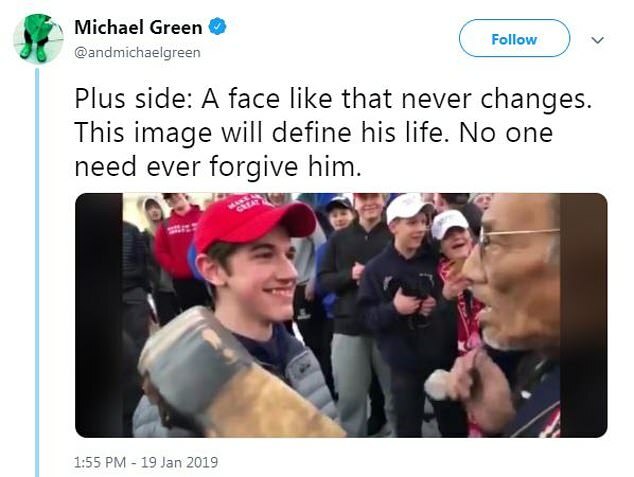 Hollywood celebrities are rushing to delete their tweets about the Catholic high school students who stared down a Native American during protests near the Lincoln Memorial after new footage suggested the confrontation was more complicated that it first appeared. Covington Catholic High School shut down its campus Tuesday as a precaution and a small protest was held outside their diocese as fallout continued over an encounter involving white teenagers, Native American marchers and a black religious sect outside the Lincoln Memorial on Saturday. Many liberal celebrities had been quick to join the angry fray, tweeting out condemnation of the teens. 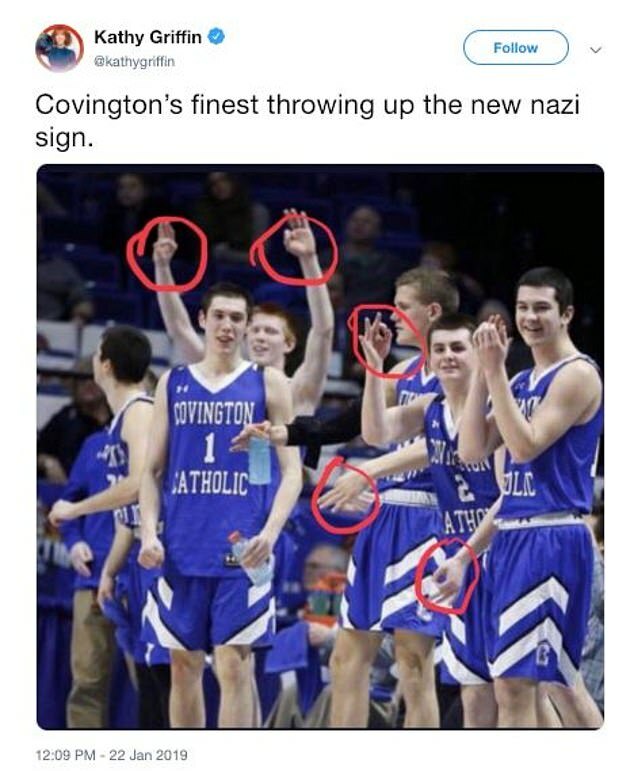 Comedian Kathy Griffin deleted a tweet on Tuesday showing a photograph of Covington Catholic High School basketball players who were 'throwing up the new Nazi sign'. In reality, the players were just holding up three fingers. In all likelihood, they were celebrating a three-point jump shot. 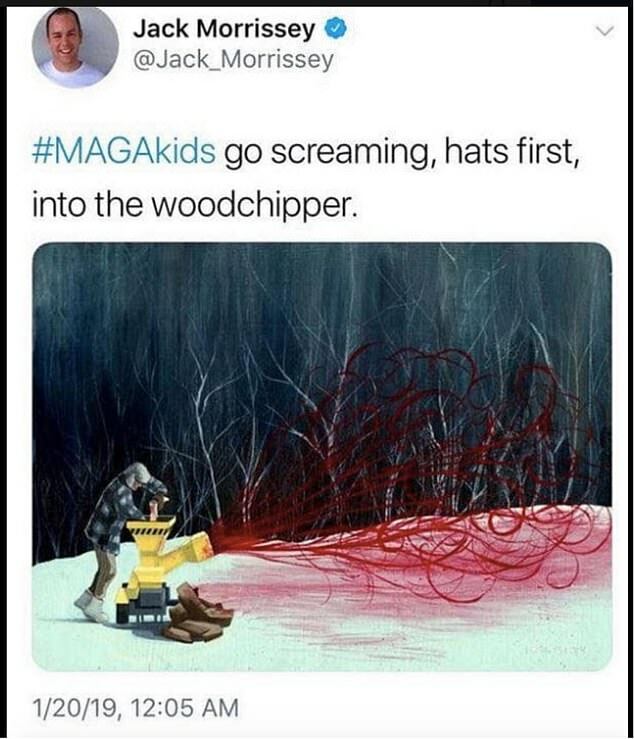 Jack Morrissey, the film producer whose credits include Beauty and the Beast and movies from the Twilight franchise, deleted a tweet about 'MAGA kids going screaming, hats first, into the woodchipper'. The tweet included a gruesome cartoon showing what looks like blood spraying out of a woodchipper. 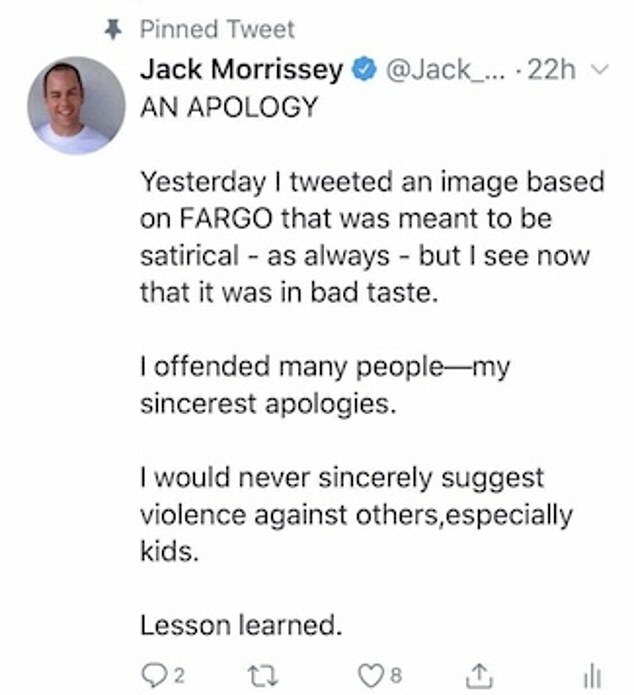 Morrissey later tweeted an apology, writing: 'Yesterday I tweeted an image based on Fargo that was meant to be satirical - as always - but I see now that it was in bad taste. 'I offended many people - my sincerest apologies. 'I would never sincerely suggest violence against others, especially kids. 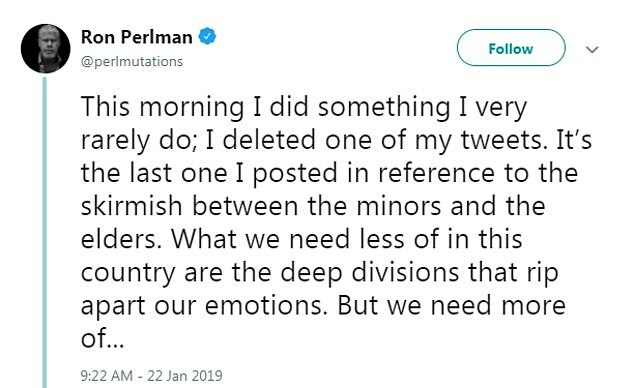 Ron Perlman, the Sons of Anarchy star, tweeted: 'This morning I did something I very rarely do; I deleted one of my tweets. 'It’s the last one I posted in reference to the skirmish between the minors and the elders. 'What we need less of in this country are the deep divisions that rip apart our emotions. 'But we need more of is to start rowing in the same boat. 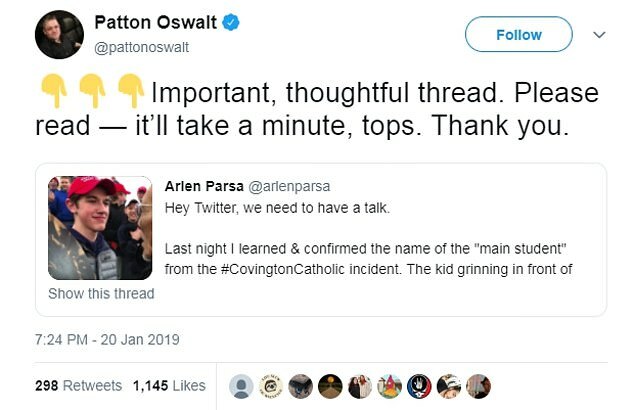 Stand-up comedian Patton Oswalt also deleted a tweet promoting a thread about the Covington teens. 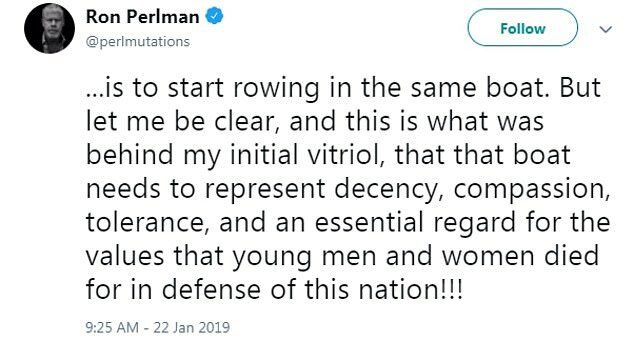 Griffin, Morrisey, Perlman, Oswalt, and others reacted to the initial viral video, which appeared to show Covington students harassing the Native American man. But since that video, more footage has been released which suggests it was not all one-sided and that there had been several different protest groups that day. It also revealed that the Native American man had approached the teens. Now some of those appear to regret their hasty tweets attacking the high schoolers. But not all. 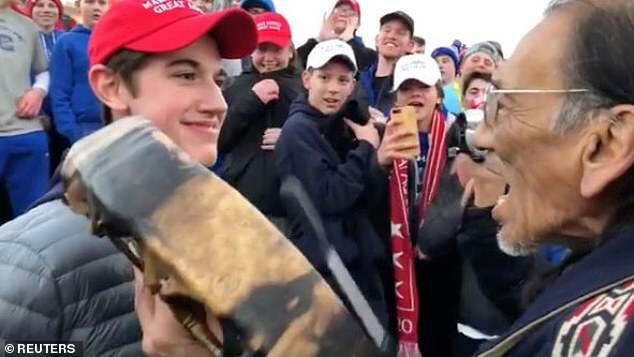 The recorded images that initially generated outrage on social media were tightly focused on the students wearing ‘Make America Great Again’ hats, who seemed to laugh derisively as they surrounded an elderly Native American beating a drum. They revealed the drummer - Omaha Nation elder Nathan Phillips - had intervened between the boys and the religious sect. That came after the teens seemed to grow rowdier and the black street preacher who had been shouting racist statements against both groups escalated his rhetoric. 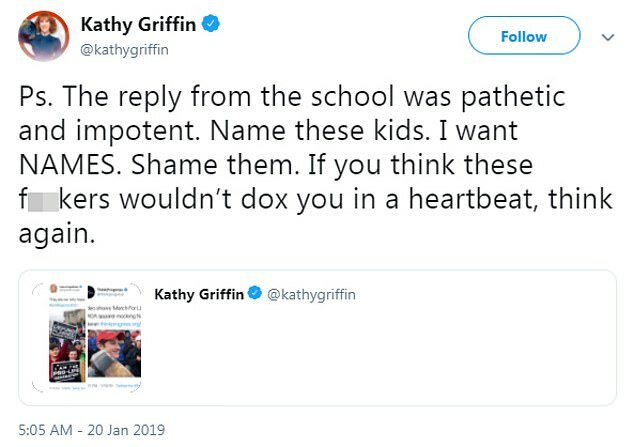 But Curtis appeared to be the exception among Hollywood celebrities who took to Twitter and demanded that the high school students be publicly shamed. In 2017, Griffin was fired by CNN and dropped by numerous comedy clubs after she released a photo on social media showing her holding a prop that was meant to depict the decapitated head of Trump. 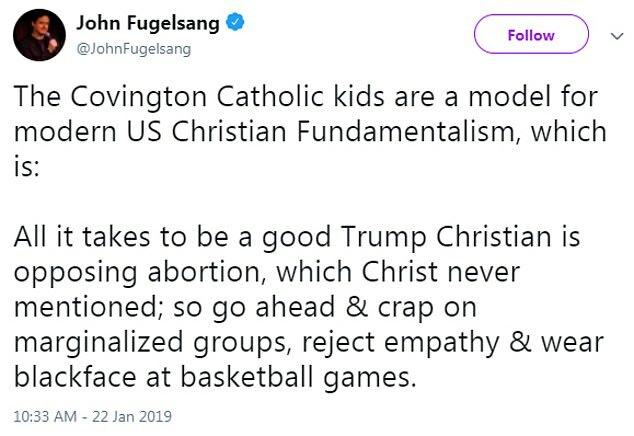 John Cusack, the High Fidelity actor who is also very vocal about his liberal political views, tweeted on Sunday: 'This Covington School thing is beyond belief…the lack of basic Respect for an elder (any elder) is the number one symptom of a SICK society….MAGA CATHOLICS paving the road of ignorance…you are a DISGRACE…look that word up, it means something….learn your History, Catholics. 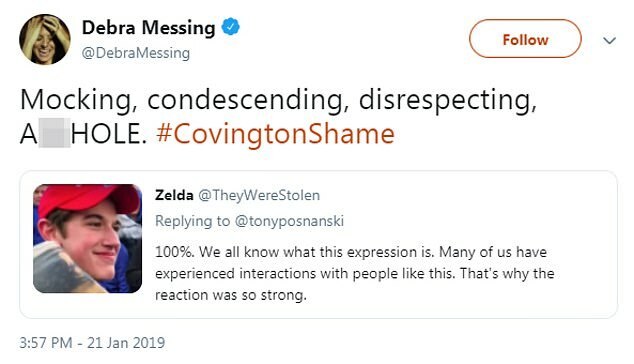 'Mocking, condescending, disrespecting, A*****E,' Messing wrote on Twitter. The student, Nicholas Sandmann, a junior at Covington Catholic, sat down for an interview with Savannah Guthrie of NBC's TODAY show. Guthrie on Tuesday posted a photo on her Twitter feed showing her sitting next to Sandmann during the taping of the interview. 'Sitting down with Nicholas Sandmann - the student at the center of the protest controversy at the Lincoln Memorial. Airs tomorrow,' the TODAY anchor tweeted. In a brief clip of the interview posted to social media, Guthrie asked Sandmann if he feels he owes an apology. 'As far as standing there, I had every right to do so,' Sandmann told Guthrie. 'My position is that I was not disrespectful to Mr. Phillips,' he said. 'I respect him, I would like to talk to him. Tune in to @NBCNightlyNews for a preview of @SavannahGuthrie's interview with Nick Sandmann. Full interview tomorrow on TODAY. Sandmann has maintained that Phillips approached him, not the other way around. 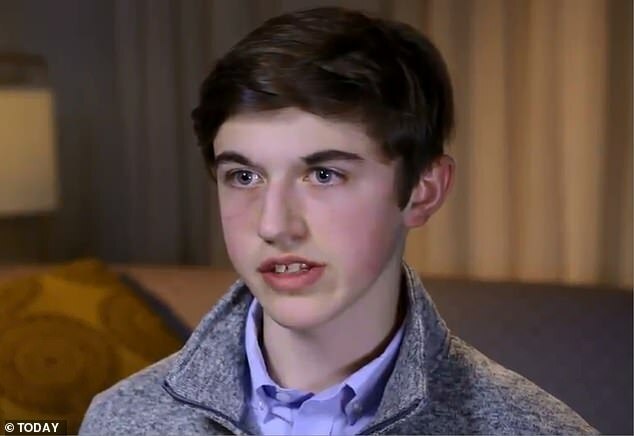 The Sandmann family has retained a public relations firm to help the teen navigate the media firestorm, according to the Louisville Courier Journal. 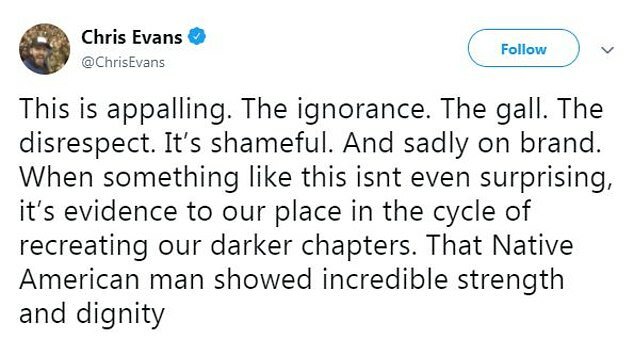 Chris Evans, the Avengers actor, tweeted: 'This is appalling. The ignorance. The gall. 'The disrespect. It’s shameful. And sadly on brand. 'When something like this isn't even surprising, it’s evidence to our place in the cycle of recreating our darker chapters. 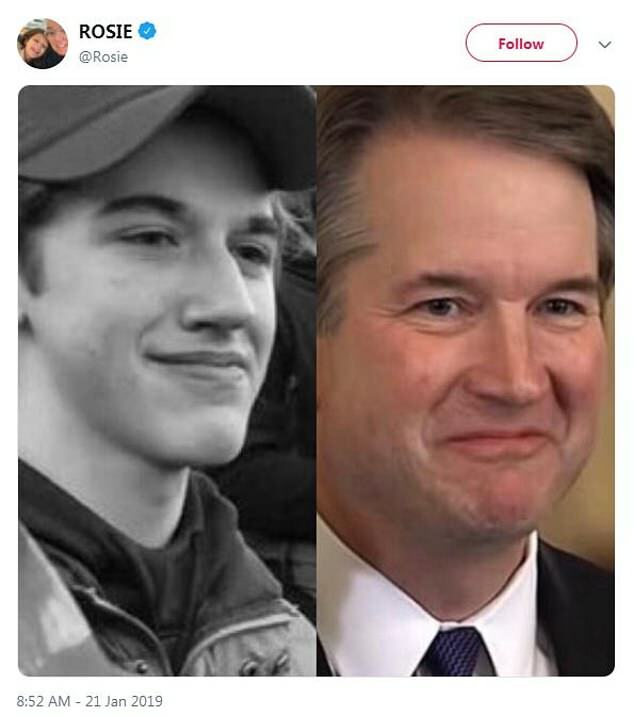 Rosie O'Donnell, who has always been an outspoken advocate of liberal causes, tweeted two photos: one of Sandmann smirking on Saturday, and the other of Supreme Court Justice Brett Kavanaugh with a similar facial expression. Kavanaugh was confirmed to the highest court in the land after a bruising process which included allegations by at least two women of sexual misconduct decades ago. Patricia Heaton, the star of Everybody Loves Raymond, denounced celebrities and public figures who want the students to be 'doxxed'. 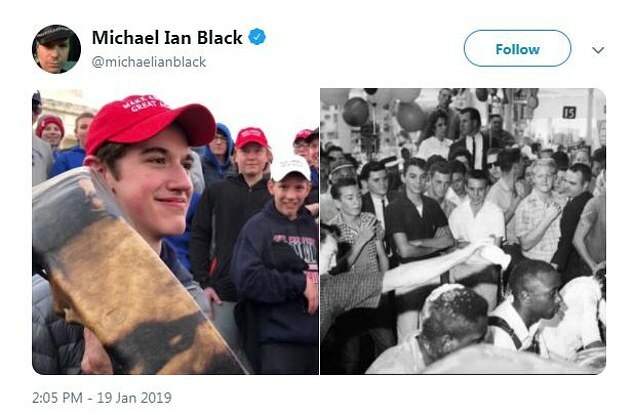 Michael Ian Black, the comedian, also tweeted two juxtaposed pictures - one of the Covington students and Phillips at the Lincoln Memorial, and the other of a white man throwing what appears to be milk on a group of black patrons at a diner as other whites look on approvingly. 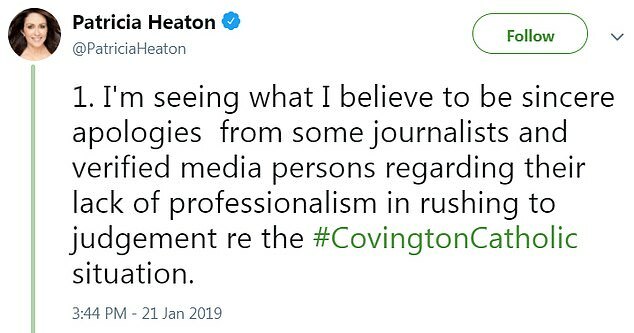 She tweeted: 'I'm seeing what I believe to be sincere apologies from some journalists and verified media persons regarding their lack of professionalism in rushing to judgement' about the Covington students. 'These apologies are welcome and necessary, but they don't address the damage that cannot be undone which was inflicted upon young people who are about to embark on adulthood - applying to colleges, looking for employment, etc. 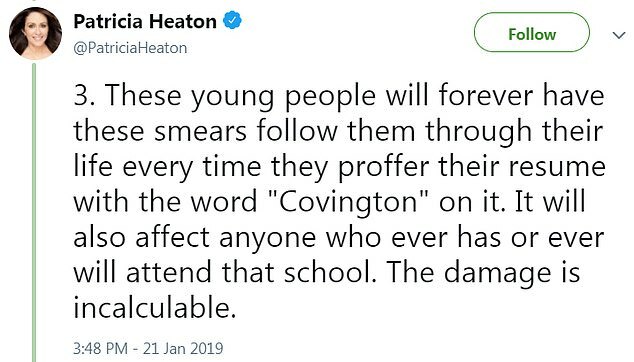 'These young people will forever have these smears follow them through their life every time they proffer their resume with the word "Covington" on it. 'It will also affect anyone who ever has or ever will attend that school. The damage is incalculable. 'And yet those who perpetrated this destruction, no matter how unintended, are still at their jobs, with nary a consequence for their reckless behavior. 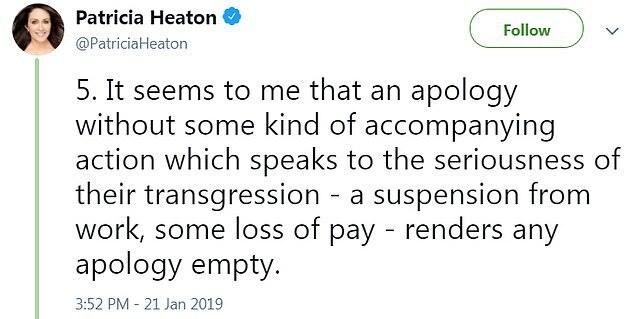 'It seems to me that an apology without some kind of accompanying action which speaks to the seriousness of their transgression - a suspension from work, some loss of pay - renders any apology empty. 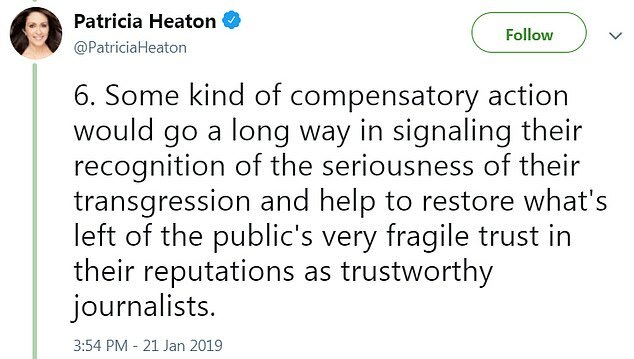 'Some kind of compensatory action would go a long way in signaling their recognition of the seriousness of their transgression and help to restore what's left of the public's very fragile trust in their reputations as trustworthy journalists. These sick liberals are about as far from compassionate and tolerant as one can get. They just make up their own facts and run with them. I feel bad for the kids, it's clear they were ambushed by this loser who has lied about his Vietnam service, among other things. It's a shame these Hollywood types are too stupid to figure out that being white and supporting the president is OK and not racist. They are just a bunch of virtue signaling losers.